WASHINGTON (CNS) — With an engaging illustration of economic inequity in the United States, Maryland Gov. Martin O’Malley told an audience at The Catholic University of America that the lessons he learned as a student there too often are lost in politics and policy. Principles including belief in the dignity of every individual; a sense that every person has a responsibility to advance the common good, and that “we are all in this together,” were taught to him at Catholic University and a Jesuit high school, O’Malley said. But in the past few decades, the economy hasn’t lived up to that, he said, as he illustrated with a group of students representing income groups. The students ended up positioned around the meeting room according to signs they held identifying them with various income brackets. Those with signs for the lowest-income brackets moved backward or only a few inches forward — showing negative or minimal income growth since the 1979 — or standing in the opposite corner of the room — representing the 224 percent growth in income for people at the top 1 percent of tax brackets. In contrast, the same exercise illustrating income growth between 1948 and 1979 resulted in a small cluster of the sign-carrying students. Income for each of the segments grew between 8 and 12 percent in those years, O’Malley explained. He said that among the factors leading to fairly similar income growth rates across all segments of the economy were: emphasis on education; development of infrastructure including roads, electricity and water service; “decent rules for capital formation” that he said allowed fairly uncomplicated business creation; “a stable and predictable rule of law”; and an immigration policy that welcomed newcomers who helped the economy grow. He spoke as part of an ongoing series of national policy forums hosted by the university’s Institute on Policy Research & Catholic Studies. O’Malley, a Washington native, graduated from a Maryland Catholic elementary school and Gonzaga College High School in Washington, and is a 1985 graduate of Catholic University. He is a one-time prosecuting attorney who has been involved in Democratic party politics since he was an undergraduate. He served on the Baltimore City Council, was Baltimore mayor for two terms and in January will complete his second term as governor. Maryland law prohibited him from seeking another term. 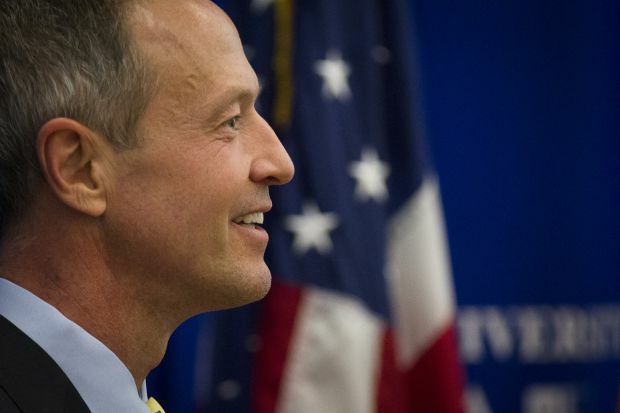 O’Malley, 51, is generally included in lists of possible contenders for the Democratic nomination for the presidency in 2016. He avoided answering a question about whether he will run. However, his presentation to a roomful of more than 100 people, mostly students, at times sounded like a campaign speech, as O’Malley highlighted successes of his terms as Baltimore mayor and Maryland governor, speaking without a text, only referring to notes for his income inequality demonstration. For instance, he talked at length about his introduction in Baltimore of CitiStat, and statewide of StateStat, based on a crime management philosophy pioneered in New York by former Mayor Rudy Giuliani. The systems function as a performance measurement approach, using short-term goals and ongoing progress reports available to the public on a wide range of government services. O’Malley also encouraged the student audience — including members of both the Democrat and Republican student clubs — to take advantage of their multiple layers of connection to others to work for a better future for the country. “The truth is that we’re really in this together and we need each other if we hope to succeed,” he said. In July, the Institute on Policy Research hosted U.S. Sen. Marco Rubio, a Florida Republican who is counted among potential candidates for president, for a similar policy forum. Martin O’Malley is a disgrace. He is pro-abortion and pro-gay marriage and scorns the teachings of the Catholic Church. Throw in the fact that he leaves office with Marylanders buried under a $900 MILLION deficit, and I’ve proved my point.